Through free elections, citizens of a democracy confer powers upon their leaders that are defined by law. In a constitutional democracy, power is divided so that the legislature makes the laws, the executive authority enforces and carries them out, and the judiciary operates independently. No one branch can control all power in a democratic system. This is referred to as the Separation of Powers. The executive arm of government is headed by the Prime Minister, Chief Minister or Premier, the leader of the elected party with the majority of seats in the House of Parliament. The Head of Government chairs Cabinet, which is comprised of ministers responsible for various departments. The Executive branch makes all decisions about government policy and set priorities for programs and services. Decisions about policies and programs take into account many factors, the wishes of the people and financial resources being the two most important ones. In constitutional democracies, executive authority is generally limited in three ways: by a system of checks and balances separating the national government's executive, legislative, and judicial powers; by federalism, which divides power between the national government and the state/local governments; and by constitutional guarantees of fundamental rights. The Legislature has three roles: legislative, financial and inquiry. Its most common role is to debate the principles of proposed legislation and to ensure that each Bill serves the people. While ideas for Bills can originate from many sources - the minister responsible for a department, Cabinet, or members of the public - Cabinet must give permission for an idea to be developed into a Bill. Legislators may approve national budgets, conduct hearings on pressing issues, and confirm executive appointees to courts and ministries. In some democracies, legislative committees provide lawmakers a forum for these public examinations of national issues. Legislators may support the government in power or they may serve as a loyal political opposition that offers alternative policies and programs. Independent and professional judges are the foundation of a fair, impartial, and constitutionally guaranteed system of courts of law known as the judiciary. This independence does not imply judges can make decisions based on personal preferences but rather that they are free to make lawful decisions – even if those decisions contradict the government or powerful parties involved in a case. Review the constitutionality of government action and legislation. Interpret legislation and resulting action. Adjudicate other disputes not necessarily involving Government action or legislation. The title and powers entrusted to the head of government depends on the type of government in place. 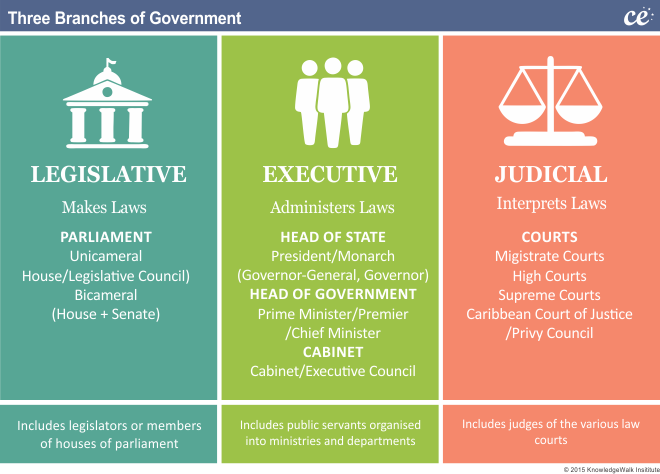 In many of the governments in the Caribbean that are based on the Westminister (or UK model), the cases the Prime Minister is the head of government and leader of the executive government. He or she is the person who leads the party or parties that command majority support in the parliament. The Prime Minister is the chief adviser to the head of state (the Governor-General). In the overseas territiories of the UK, the head of government has similar functions to that of a Prime Minister, but may be referred to a Premier or Chief Minister. In coutnries with a republican-style government, the head of government is also the head of state and may be referred to as the President. The Head of Government is the leader of the party or parties that retain the support of the House of Representatives. The Head of Government has responsibility for advising the Governor General of ministerial appointments. The Head of Government allocates ministerial positions. The Head of Government chairs the Cabinet, determines the Cabinet agenda and oversees the work of the government. In the Westminister styled governments, the Head of Government chooses election dates. The PM is the public face and spokesperson for the government, both domestically and internationally. Even though a Foreign Minister is appointed, the Head of Government usually takes on the role of international spokesperson for the nation. The Head of Governments position assumes power and prestige because the media focuses on the Head of Government. This means that the Head of Government is often able to go over the head of his colleagues and party and communicate directly with the electorate. The Head of Government has the power of patronage. In many countries in the Caribbean positions such as Governor-General, judges of the High Court, Chairmen of Satutory Corporations, etc., fall within the gift of the Head of Government. The Head of Government identifies individuals to whom special responsibilites or portfolios are given such as the environment, policing, health, technology or education. These individual who may elected or selected members of parliament (depending on the electoral system) are referred to as 'Ministers' and form the Cabinet which is led by the Head of Government. A Cabinet may also include “Ministers of State." These are junior Cabinet officials that do not have their own government department. They are, instead, often given the responsibility for aiding a senior Cabinet Minister, and will have specialized duties within that Minister’s department. It may also be the case that Ministers of State are given responsibility over some temporary government agency or program that is expected to last only a short period of time. Cabinets set strategies and tactics to advance the policies they consider important – and Ministers have to develop the policies in the light of their colleagues’ preferences, their officials’ capacities, the budget resources negotiated annually, the priority setting competition in which they have to engage and the political will. Different Cabinets have different views as to how government resources should be spent. Cabinets, influenced by their parties and the electorates that put their Members into Parliament, may have ideological or interest group support that influences how they allocate resources. While the Cabinet meets as a whole, much government business is also handled in specialized Cabinet committees. For example, there may be an ‘Economic Committee,’ consisting of Cabinet Ministers who have portfolios related to the economy (such as the Trade Minister and the Minister of Industry). A ministerial portfolio includes government departments and agencies that are responsible to their Minister for funding and decisions that will affect the State. Government departments and agencies are also referred to as the public service or the public sector. People who work in the public sector are called public servants.A Minister is accountable to Parliament for each department's functions and activities. The Opposition constitutes the second largest political party or coalition of parties in the parliament. The Opposition holds an important position in the Parliament and contributes to the overall effectiveness of Parliament by monitoring the Cabinet and encouraging the Government to make well-planned and appropriate decisions. The Opposition’s main role is to scrutinise, appraise and criticise effectively the policies and administration of the Government.and hold it accountable to the public. The Opposition uses various opportunity within the procedures of the parliament to carry out its role such as Budget debates, legislative debates and No Confidence Motions. The Opposition also utilises the media to reach the electorate with its views and to establish an identity as an alternative government. The Opposition usually establishes a Shadow Cabinet that consists of MPs, senators, and other individuals from the opposition party (or parties). The role of the Shadow Cabinet is to examine the work of each government department and policies developing in their specific areas. It is the duty of the Shadow Cabinet to respond to Government policy initiatives and offer alternative policies to the electorate. effectiveness of Parliament largely depends on the strength of the Opposition. The Speech from the Throne - Written by the government, the Speech from the Throne is read by Head of State or his/her representative at the opening of every new legislative session. The speech outlines the government’s plans for the session – to introduce a tax cut, for example, or to increase spending on hospitals. In some countries, parliamentarians then have an established period to debate the government’s plans and priorities. The Budget - By law, the government must introduce an annual budget by the end of the previous fiscal year. Read by the Minister of Finance, the budget speech outlines how much the government’s new and ongoing programs will cost and where it will get the money to pay for them (from taxes, for example, or other revenue). Parliamentarians then have an established period to debate the budget and question the costs and figures. Next, the government’s figures and spending plans are reviewed by a committee. Debates on Bills - Any parliamentarian may propose a new law (called a bill), but most are introduced by Cabinet ministers. All bills must pass through a stipulated set of “readings” before becoming law. This gives parliamentarians the time to examine each bill closely and suggest changes or improvements. If the majority of parliamentarians support a bill, it will eventually become an Act - otherwise known as a law. All political parties go into an election hoping to win a majority of seats in Parliament. The reason is very simple: if a party wins more than fifty percent of the seats, then all of its bills will be passed. A majority government is one where members of the leading political party make up more than 50% of the legislature. They do not need help from other parties to pass legislation into law because they have the majority of the votes needed. Consistency -They can pursue a consistent government policy throughout the whole term because they don't have to compromise with any other parties. Efficiency - The government can make swift decisions on pressing issues without long and drawn out negotiations. A minority government has the most seats of all the parties but has 50% of the seats or less. They need to make "deals" with other parties in order to pass legislation into laws. Minority governments can be defeated if the other political parties work to together to defeat the government and force an election. A minority government can form a coalition with another party (or parties) to make a block of more than fifty percent of the seats. Once they have fifty percent of the support, they need to compromise to keep all of the coalition members happy. A minority government is inherently unstable because the coalition could fall apart at any time. Responsiveness - The government must respond to the views of all members of government. Instead of the Prime Minister and Cabinet making all the decisions, the opinions of all representatives are listened to. Accountability - Because the government relies on the votes of other parties, the opposition can make the government accountable for all of their actions. Transparency -There is a lot of communication in passing a bill, therefore the government is forced to communicate their intentions to the other parties. There are many types of government. Some people simplify them into Four types, but there are others who break these categories down into more complex definitions. Absolutism A system of government where there are no constitutional limits imposed on the rulers. Anarchy A rejection of imposed governments and the view that society should be ordered through freely co-operating individuals. Authoritarian Rule by command with little or no attention to public opinion, individual rights or public consent. Autocracy Government through a single leader who uses power in an arbitrary way rather than through reference to a system of law. Capitalist In a capitalist or free-market country, people can own their own businesses and property. People can also buy services for private use, such as healthcare. But most capitalist governments also provide their own education, health and welfare services. Communist A government in which there is common ownership of all property. It provides its people's healthcare, education and welfare. Democracy A form of government where the people exercise political power Everyone who is eligible to vote has a chance to have their say over who runs the country. Despotism Rule by a single leader, all his or her subjects are considered his or her slaves. Dictatorship A form of political rule by one person who governs unrestricted by legal, constitutional or conventional constraints In a military dictatorship, the army is in control. Federal In this type of system, a central government shares power with a number of small local governments. The USA is a type of this, called a federal republic. Monarchy A monarchy has a king or queen. In some traditional monarchies, the monarch has absolute power. But a constitutional monarchy, like the UK, also has a democratic government that limits the monarch's control. Oligarchy A form of government which consists of rule by a small and unrepresentative elite group who rule in their own interests, especially the accumulation of wealth and privilege. Plutocracy A system where the rich rule and the poor have no share in government. Populism A system which is based upon direct communications with the people. Regional or local A government or council that controls a smaller area within a country. Some local governments have very limited powers and are mainly controlled by the central government. Others are powerful enough to make their own laws, like individual states in the USA. Republic A republic is a system where the head of state is not selected on a hereditary basis. The head of the country is usually an elected president. Revolutionary If a government is overthrown by force, the new ruling group is sometimes called a revolutionary government. Socialism A system where the community has some control over the means of production. Theocracy A form of government where the rulers claim to be ruling on behalf of a set of religious ideas, or as direct agents of a deity. Totalitarianism Often linked with modern nation states where the emphasis is on technologically advanced instruments of mass communications. This allows the people to be organised, mobilised and controlled. Transitional A country that is changing from one type of government to another has a transitional government. For example, a dictatorship may turn into a democracy after the dictator dies. The change between governments can take several years.